The first challenge hosted by me after being given permission to use the code written by Jase. This challenge consists of 11 venues and 44 species. The tasks in this challenge are named A-Z with two tasks for each letter. This A-Z theme was based on an idea by FG & Jester. Minimum Version for this challenge is 2.13b. Note: If you enter and pass the first task at the same time, your name will appear twice so please catch something else first! Click the picture to enter or this link. To enter this challenge you need to be a member of the FS2 Pro Club. You can apply to join by contacting Glen. 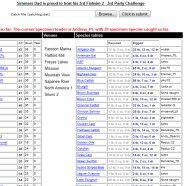 This challenge consists of 12 venues and 44 species chosen by Glen. The tasks were set by Simmers Dad, FG, Jester & JBW. 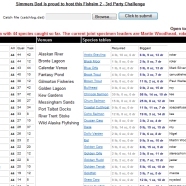 The 3rd SD challenge consists of 8 venue and 44 species.. There are no tasks in this one, just try for qualifying weights. Copyright (c) 2012 Simmersdad.net (Robin Sims). All rights reserved. Original design by CSS Templates.